Negotiating is part of life. You discuss with your friends where to have lunch. You try to agree a price for a second-hand car. Lawyers argue about compensation after an accident. Competing companies try to form joint ventures. All these situations rely on the art of negotiation. Most people use a hard or soft style when negotiating. Soft negotiators try to avoid conflict and give way to reach agreement. Hard negotiators see an opportunity for a battle that they must win. 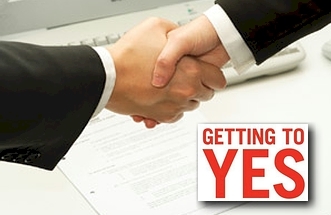 A third style is principled negotiation, described by Roger Fisher and William Ury in their book, Getting to Yes. If you are a principled negotiator, you will try to decide issues on their merits, not on tough haggling. You will look for ways for both sides to gain. Separate the people from the problem. Try to make both sides feel that they are working together to solve a problem, not in a fight. Focus on interests, not positions. A negotiating position often hides someone's real interests. ‘I want the window open and you want it shut,’ really hides: ‘I want some fresh air and you want to stay warm’. Make a number of possibilities before deciding what to do. Trying to come up with one right answer is difficult, especially under pressure. It's better to make a list of possibilities, and then agree to decide later. Insist that the result is based on an objective standard. This stops people being stubborn. For example you might agree to take the average value of cars advertised in a newspaper. You could use this to decide a fair price for you to buy your friend's car. Whether it's where you sit in your classroom, or how you handle a complex company merger, principled negotiation allows you to get what you want without making enemies.